List Rules Upvote the deaths that were the most gruesome and disturbing. Quentin Tarantino doesn’t make movies with pat happy endings. The writer/director’s movies are about revenge, crime, robberies gone wrong, atonement, and characters that are neither good nor bad, but exist in a shady area of gray that makes everyone around them feel just a bit uncomfortable. Yes, Tarantino’s films are unapologetically violent and gory, sometimes to the point where you’ll want or need to turn your head away. These are the most violent scenes in Tarantino movies. The auteur’s use of blending violence with humor is a trademark in all of his films. So while heads are being decapitated, limbs are being chopped off, and blood is being spilled everywhere, much of Tarantino’s violence has an air of humor to it. He told CBS News in 2009, “I specialize in making you laugh at things that aren't normally funny. 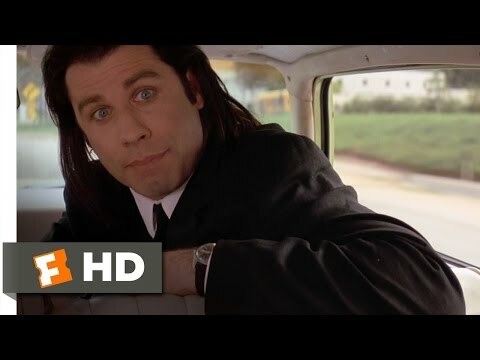 John Travolta turns to the guy in the backseat of the car and accidentally blows his head off. And that is a funny sight gag." The total list of deaths in Quentin Tarantino movies is hard to track. In 2013, Vanity Fair attempted to work out the body count of all eight films that Tarantino has directed. They’ve estimated that 560 people die on-screen. That number of course has a giant asterisk next to it. Who knows how many people actually died in the theater fire in Inglorious Basterds, the number of the dead during the shootout in Django Unchained, or how many ninjas The Bride really killed in Kill Bill. One thing is for certain, death in Quentin Tarantino movies is inevitable. It even comes to your favorite characters. No one is safe from the bloodbath. What are the most violent scenes in Tarantino movies? That’s for you to decide. Vote up what you think are the most gory and disturbing scenes of the director's canon. Stuntman Mike turns off his headlights and waits for the four young girls in a car driving towards him. When he's ready, he races in their direction, ready for the high-speed head-on collision. Just before the noses of their cars smash, Stuntman Mike turns his lights on. Tarantino then shows us the collision four times, from the point of view of each girl. Limbs fly, heads roll, and of course blood spills everywhere. "I Shot Marvin in the Face"
This scene is classic Tarantino, blending violence with humor. Vincent and Jules just got ambushed and somehow managed to escape a barrage of bullets. Marvin is riding in the backseat of the car, and the hit men are berating him. Vincent has his gun out, and he accidentally shoots Marvin in the face. The poor man's brain matter is stuck in Jules's hair and bits of his head are everywhere in the car. The Bride doesn't care if she has to kill all 40 members of the group that calls themselves the Crazy 88 in the original Kill Bill. Tarantino directs this massacre like an elaborate ballet. That is, if the ballet consisted of severed heads, flying hatchets, and scattered limbs. Sgt. Donny Donowitz, aka The Bear Jew, is perhaps the most feared member of the Basterds. The Germans know that he uses a baseball bat to inflict his pain. In this ultra violent scene, the Sgt. certainly doesn't hold anything back.